We are thrifty and proud! 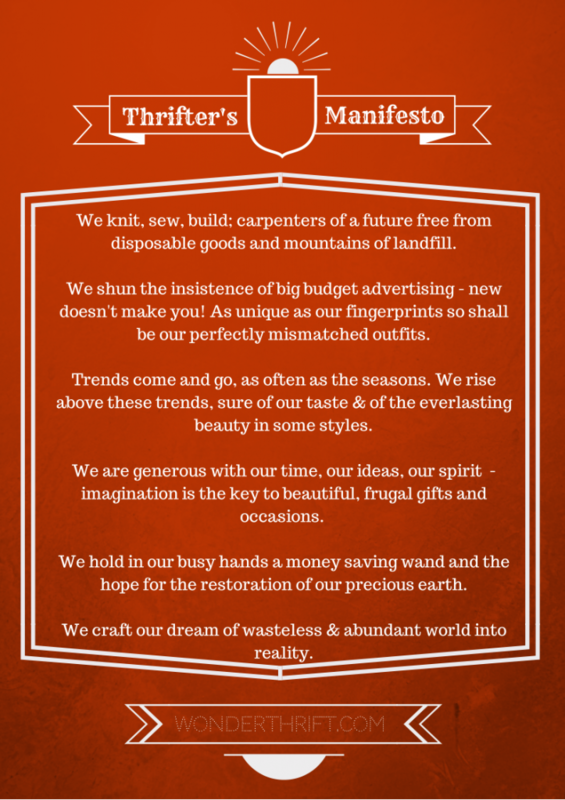 We knit, sew, build; carpenters of a future free from disposable goods and mountains of landfill. We shun the insistence of big budget advertising – new doesn’t make you! As unique as our fingerprints so shall be our perfectly mismatched outfits. Trends come and go, as often as the seasons. We rise above these trends, sure of our taste and of the everlasting beauty in some styles. We are generous with our time, our ideas, our hands, our spirit, our creativity – imagination is the key to beautiful, frugal gifts and occasions. We hold in our busy hands a money saving wand and the hope for the restoration of our precious earth. We craft our dream of a wasteless and abundant world into reality. What would YOU put in your manifesto? Inspired by the magnificent Fixer’s Manifesto and the superb Craftifesto.